Just as a skylight is an opening in the roof, either admitting a brief illumination of light or giving outsiders a peek as to what’s inside, so Jose Saramago gives us a view of the inhabitants of an apartment building in Lisbon during the early 1950’s. Each member becomes almost as familiar to us as the members of our own family; in fact, I felt as if I was living in the apartments with these people. Which wasn’t always a pleasant feeling, for we are face to face with a lonely cobbler and his wife who have recently taken on a renter, a beautiful mistress and her benefactor, a family of four spinster women: the mother, aunt and two adult daughters, and an embittered couple with their ten year old son. Each family has its own dreams and disappointments; their lives are lived out before us as a slice of life. We, as the reader, never leave the apartment. But, we see the complexities and emotional drama inherent to each person. We find ourselves taking sides, nodding our heads in agreement with a conversation, or silently cursing foolish choices. When I closed the book, I had only an indication of where each person’s path would take them. Nothing is wrapped up or finalized. But I saw that the steps which had been taken would be next to impossible to reverse, and that for each family, nothing much would change. The elderly cobbler and his wife would continue to love each other throughout their old age and loneliness; the mistress would continue to find a benefactor who would support her financially; the embittered couple would go their own way with excuses for needing freedom; and the four women would listen to classical music as they continued to stifle their inner passions. It isn’t concluding what would happen that makes this novel fascinating, it’s discovering who each character is, how he thinks, and what prompts him to take each step in his life. It is no wonder to me that Skylight is in the top of the important book lists lately. Although it took almost four decades to be published, it is a beautifully written observation of human lives. I will be thinking of it for a long time to come. This sounds like a good option when I am looking for a Poetuguese author. Yes, Blindness was the first novel I read by Saramago. It was incredible. It occurs to me, as my French is fading away, that you are referring to Life, a User’s Manual, which I reviewed here. How brilliant of you to compare the two! I didn’t link them in my mind, but now I can see how one would cause you to think of another. Thanks for that connection! It’s been a while since I read anything by Saramago, but I’d like to return to his work at some stage. Blindness is in my TBR, so I ought to read that one first, but the character-driven nature of Skylight sounds right up my street. Thanks for reviewing this, Bellezza. Blindness is a wonderful novel, the first by Saramago that I read. It was very powerful, and to me, a statement on our human condition. 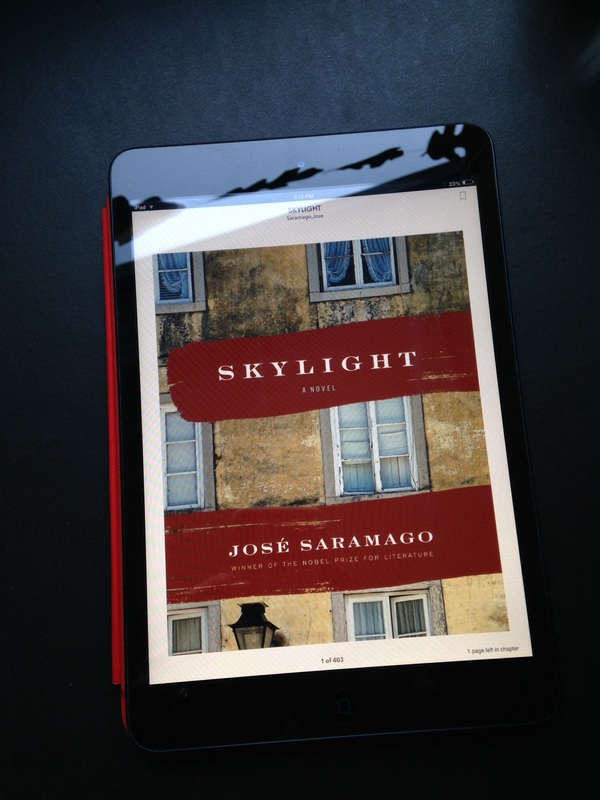 I think you would enjoy Skylight very much; not that it matters, but it’s short, (around 350 pages on my Kindle) and the writing is so compelling. I was absolutely driven to learn more about each character he created, and I feel that I have an understanding of their personality, and their future, once the novel is finished. Ah, Saramgo’s earlier novel; I enjoyed it more than I expected. It’s very conventional in form, but it has so many of the themes and tones he’d employ later on; there’s a sweet sadness running through the narrative, fondness for ordinary people, a bit of digression. It was a very mature novel already. And since this novel seems to be catching on with English-language readers, I hope that means his first novel, Terra do Pecado, which is equally enjoyable, will eventually be translated. I like how you say, “a sweet sadness running through the narrative.” That’s so true! I found it very tender in places, particularly with Silvestre, the cobbler and his wife. I loved Silvestre’s wisdom, which he tried to impart to Abel to no avail. Shocking that this novel was lost by the publishers! I’m so glad that we have it available to us now. I’d like to read more by Saramago, having only read Blindness, Skylight and bits of Balthazar and Blimunda (which I disliked). I also started my Saramago reading with Blindness and it was incredible. So much so that the second Saramago I read sort of failed to impress (I can’t even remember the title off the top of my head). Maybe Skylight would get me back on track with him. Skylight was fantastic, quite unlike the most tedious Baltasar and Blimunda I tried to read before throwing down in disgust halfway through. Was that the one you were referring to? Skylight, like Blindness, is accessible and has important things to say about the way “we” live. I had to go back and look, it was “The Cave”. I didn’t enjoy it because I felt it was quite predictable and the lessons a tad too obvious. Thank you so much for bringing this book to my attention. I’m gong to load it on my iPad right now! Beth, I hope it’s available for purchase now! This was a review copy from the publisher, and I’m not quite sure when it comes out in stores. In any case, it’s so worth reading. It’s lovely to have you stop here, by the way. I’ve only read Blindness at this point. I did try the one where Portugal breaks free from the rest of Europe and floats away, I forget the title, but I didn’t get very far. While this one sounds like a very familiar plot device, it is one that works pretty well for me, as a reader, most of the time. And I would like to give Saramago another go. Maybe that was Baltasar and Blimunda; if so, I didn’t get very far either. Nor do I regret not going past the midpoint. His writing style in this book, an early one for him of course, and the plot device, are very effective. I think you’d enjoy Skylight as much as I did. I’ve always wanted to read Saramago, but for some reason never picked up one of his books. However, after reading your thoughts on this one, I think it is definitely time to give his writing a read. Skylight sounds fantastic! I love the idea of getting to know these inhabitants of this apartment building – a slice of life sounds like a great read to me. so happy to see this review. I read about Skylight in The Guardian Weekly only a week ago and have it on order from my library. Will come back and read this post properly when I’ve read it. It’s funny, but Skylight is a book I’m still thinking about! Even just last night I was reviewing it in my mind, dwelling with the characters. I hope you like it, too! I’d love to hear your thoughts when you’ve read it.